Includes 30 line drawings by the inimitable Quentin Blake. This story of author's childhood; tales of exciting and strange things - some funny, some frightening, all true. Boy, Roald Dahl's bestselling autobiography, is full of hilarious anecdotes about his childhood and school days, illustrated by Quentin Blake. An autobiography is a book a person writes about his own life and it is usually full of all sorts of boring details. This is not an autobiography. (Roald Dahl). This reissue, in brand new Roald Dahl branding, includes 30 delightful line drawings by the inimitable Quentin Blake. Throughout his young days at school and just afterwards, a number of things happened to Roald Dahl, which made such a tremendous impression he never forgot them. 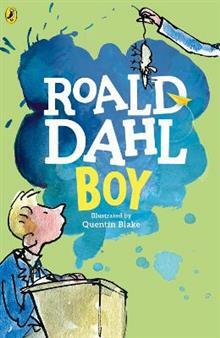 Boy is the remarkable story of Roald Dahl's childhood; tales of exciting and strange things - some funny, some frightening, all true. You can listen to all of Roald Dahl's stories on Puffin Audiobooks, read by some very famous voices, including Kate Winslet, David Walliams and Steven Fry - and there are added squelchy soundeffects from Pinewood Studios! Also look out for new Roald Dahl apps in the App store and Google Play- including the disgusting Twir or Miss! and House of Twits inspired by the revolting Twits.